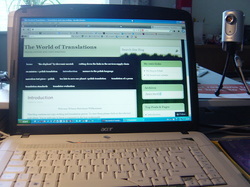 I am a native Polish linguist with over 25 years experience in the line of translations/transcreations. My language combinations are: English > < Polish and French > Polish. The above motto means I translate into Polish rather than Polglish (a hybrid of Polish and English), i.e. I respect the syntax of the language I translate into, therefore my translations are of the above average standard. I do not sub-contract, therefore there's no lengthy supply chain which can hinder effective communications. I deal with you directly and therefore there's a lower risk of miscommunication or messages getting misplaced. As I have no overheads, you're only charged for the linguistic service rather than the administrative procedures and obtain thus your value-for-money. It is a creative translation i.e. : translation combined with copy-writing or in other words: a linguistic adaptation. Translation should always be "sense-for-sense" rather than "word-for-word" to be intelligible and in some areas, e.g. : Advertising, Marketing, Poetry etc... it is of utmost importance. Translators have to use their creative skills to produce results that would convey the message of the original, though the syntax and the concepts used may differ considerably. As an example here's a well known proverb in both French and English: Chat échaudé craint l'eau froide = Once bitten, twice shy. Translated literally: A scalded cat fears cold water is not idiomatic and therefore doesn't evoke the required connotation.